The devastating tornado that ripped apart Moore, Okla., on Monday now joins the ranks of America’s strongest twisters on record, coming almost exactly two years after a similarly extreme and deadly tornado struck Joplin, Mo. In trying to make sense of the tragedy that unfolded in Moore, here are some of the things we know and don't know about tornadoes, and whether or how climate change may be influencing them now and into the future. Tornadoes are no stranger to the U.S., which sees the majority of the world's tornadoes. The heart of “Tornado Alley” — where warm, moist air collides with cooler, drier air coming from the West — runs right through Moore, and the town was severely damaged by a tornado in 1999 as well as by less damaging twisters since. 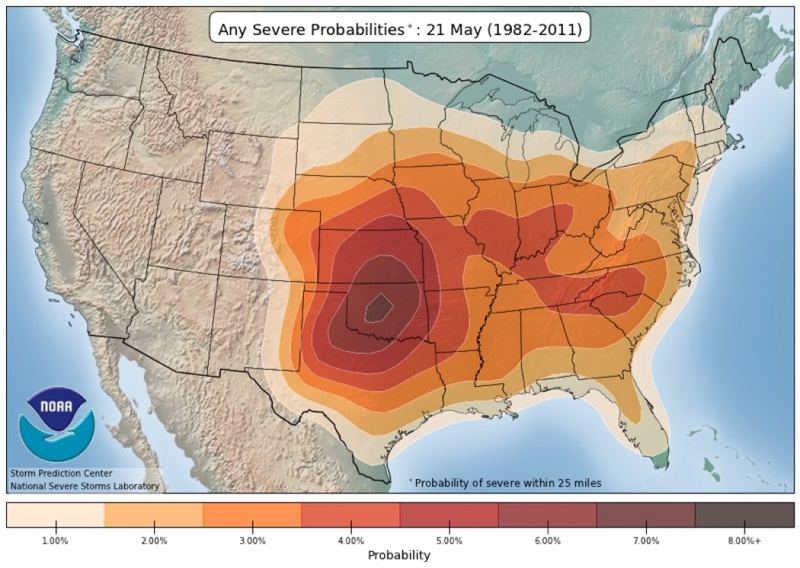 Based on data from 1982-2011, Oklahoma City was the likeliest spot in the country for seeing severe thunderstorms on May 20. Tornado statistics show that the Oklahoma City metro area has had the most direct tornado hits of any American city, with at least 100 since 1890. That's according to the Storm Prediction Center in Norman, Okla., which is situated just down the road from Moore, and whose forecasters were forced to take shelter as the storm moved through. Probability of severe thunderstorms within 25 miles of a location as averaged from 1982-2011. This shows the highest odds of severe weather on Monday were in Oklahoma. In recent years, tornado researchers and climate scientists have been trying to make advances in unlocking the secrets of what causes such monster storms, and how manmade global warming may already be affecting them now and in the future. While the understanding of climate and tornadoes is progressing slowly, far more rapid gains have been made in the ability to forecast tornado outbreaks days in advance, and to detect and warn people when (or preferably before) tornadoes touch down. During the past two years, the National Weather Service upgraded its nationwide network of Doppler radars to take advantage of dual-polarization technology, which allowed forecasters in Oklahoma to provide an exceptional lead time of 16 minutes before the tornado struck Moore — far more than the average tornado warning lead time of 13 minutes. Tornado data does not reveal any clear trends in tornado occurrence or deaths that would suggest a clear tie to global warming, at least not yet. 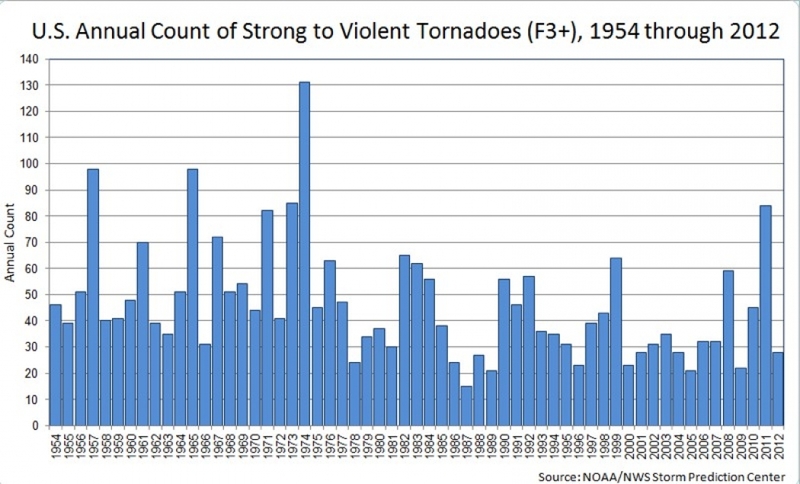 A recent paper published in the Bulletin of the American Meteorological Society found that the occurrence of EF-1 and stronger tornadoes on the Enhanced Fujita Scale has shown no trend since 1954, which was the first year of near real-time data collection. Instead, an increase in tornado counts of EF-0 or stronger tornadoes has been attributed to an uptick in observations of very weak tornadoes. The Enhanced Fujita Scale measures tornado strength based on the extent and type of damage that they cause (no surface weather station has ever survived a direct tornado strike to take wind measurements from inside a twister). Number of annual EF-3 or greater tornadoes from 1954 to 2012. It's difficult to tease out trends from historical tornado data, due to changing reporting practices, population growth, and the advent of advanced radar technology that has allowed meteorologists to spot more tornadoes now than ever before. It's thought that many tornadoes — particularly weaker ones — were missed in the early decades of recordkeeping, and construction methods have also changed with time. That's important since the strength of a tornado is determined by post-storm damage surveys. “We have little confidence in the accuracy of trends in the meteorological occurrence of severe thunderstorms (including hail storms) and tornadoes,” according to a recent study published in the Bulletin of the American Meteorological Society. Similarly, there is no evidence to indicate that EF-4 and EF-5 tornadoes — like the one that decimated a large swath of Moore — are becoming more frequent or severe. Such tornadoes are rare — they comprise less than 1 percent of the total number of tornadoes — yet they are the most reliable killers, accounting for 70 percent of tornado fatalities. The record annual number of EF-4 and EF-5 tornadoes occurred in 1974, when 36 such tornadoes scarred the landscape of the Midwest and Great Plains. Between 2000 and February of this year, there were 129 EF-4 and EF-5 tornadoes, according to a Storm Prediction Center database. For example, the record 2011 tornado season, which featured a whopping 1,691 tornadoes — the second highest number on record — and 553 fatalities, was followed by one of the least active seasons on record the next year. According to the Storm Prediction Center, in 2012 there were just 939 tornadoes and 70 fatalities. Because historical tornado data is not considered very reliable or consistent, scientists have focused especially closely on how a warming climate is altering the balance of ingredients that go into producing a tornado. 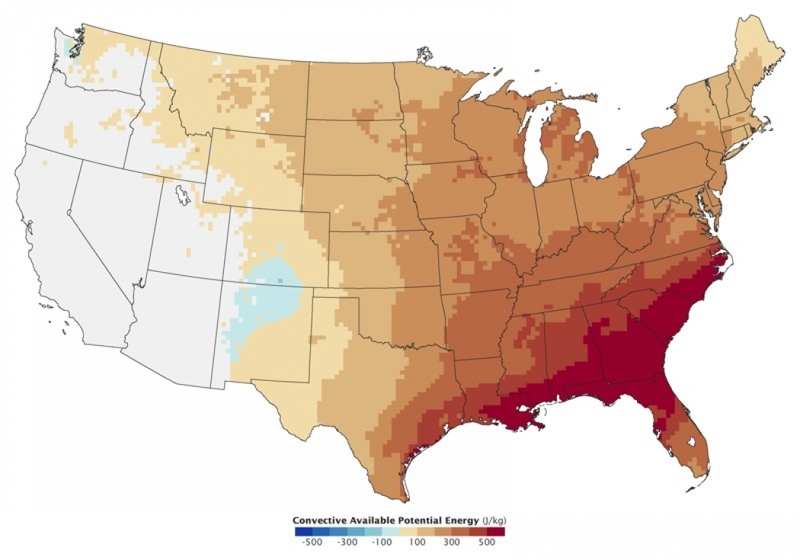 The results of a computer-modeling study comparing the projected summer climate in 2072–2099 from 1962–1989. CAPE is predicted to rise enough to overwhelm a slight decrease in vertical wind shear, leading to an increase in severe thunderstorm days, particularly in the eastern states. The predicted decrease in vertical wind shear from the same modeling study. A key ingredient for producing tornadoes is a warm, moist, and unstable atmosphere. That means there needs to be high levels of humidity, and conditions in the middle to upper layers of the atmosphere need to encourage a rapidly rising motion of air. Such conditions were present on Monday, as demonstrated by the sky-high reading of one metric that meteorologists use to quantify atmospheric instability — known as “Convective Available Potential Energy,” or CAPE. The CAPE reading in central Oklahoma was approaching 4,000 joules per kilogram on Monday. CAPE is a measure of the potential energy available for storms, and how much warm, moist and buoyant air is present in a given area. A CAPE value above 2,500 is considered to be an indication of extreme instability in the atmosphere, which means that if a trigger comes along for a storm, such as a cold front, storms could develop rapidly and quickly turn severe. The high amount of instability on Monday helped thunderstorms explode along a slowly moving frontal boundary separating hot, humid air to the east from comparatively cooler and drier air to the west. This satellite loop shows the massive mushroom-like clouds, which reached heights of up to 60,000 feet above the surface, forming suddenly, as if lit by a fuse on Monday afternoon. Satellite loop of the severe thunderstorms that spawned the Moore tornado. Credit: NOAA. 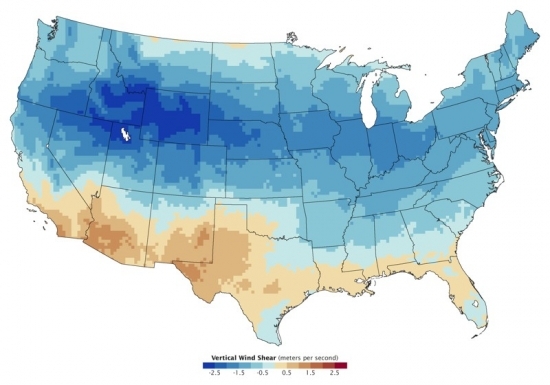 Climate studies show that atmospheric instability has already been increasing in some parts of the U.S., although not by a sufficient amount to make it distinguishable from natural variability, at least not yet. Computer-model projections of how instability may change in the future, though, show that this tornado ingredient is likely to increase because of warming surface temperatures and the addition of moisture in the air through evaporation. That increase in atmospheric instability could boost the number of days with severe thunderstorms in parts of the U.S.
One study, published in the Proceedings of the National Academy of Sciences in 2007, found that a doubling of greenhouse gases in the atmosphere would boost the number of severe thunderstorm days in parts of the U.S., particularly in the Southeast and along the East Coast. Some cities, including New York, could see twice as many potential severe thunderstorm days by the end of this century as they experience today. Another necessary ingredient for tornadoes to form is atmospheric wind shear, which occurs when winds change in speed or direction with height. Wind shear was also present in abundance on Monday, which is why weather forecasters had highlighted that region as the most at risk for significant tornadoes. In fact, some studies, including a paper published in the journal Atmospheric Research in April, have shown that wind shear is a more critical ingredient for strong tornadoes to occur than atmospheric instability, suggesting that a decrease in shear could limit the potential for the strongest tornadoes to occur in the future. While a warmer climate is likely to feature more opportunities for thunderstorms to form, studies also show a lessening of atmospheric wind shear, which would suggest a decrease in the potential for tornadoes to form. How these two trends play out — one increasing the odds of tornadoes, the other reducing them — is a subject of active scientific research. One inference from the research to date is that given the likely abundance of instability in coming decades, when adequate wind shear to produce tornadoes is also present, tornado outbreaks could be even more extensive than they are today, although by how much is a question yet to be addressed. Advances in computer modeling will may soon enable scientists to better simulate small-scale events such as tornadoes, and the conditions that trigger them. The bottom line? So far, there’s simply not enough information to say anything definitive about the future of tornadoes under climate change. But every thunderstorm, and every tornado, now takes place in a warmer, wetter atmosphere due to the increasing concentration of greenhouse gases in the atmosphere.